We try to never miss New York Times SCOTUS reporter Adam Liptak’s column — he is always tracking down some interesting legal character or getting behind the scenes in an interesting trial.But somehow we missed his piece yesterday, and we thus missed this: Yale Law School’s Lillian Goldman Law Library is acquiring, and safekeeping for posterity, bobblehead dolls depicting the Supreme Court justices. The justices (Yale picked up Rehnquist’s most recently) have been standouts all of their lives, and their bobbleheads are no different. What’s so special? 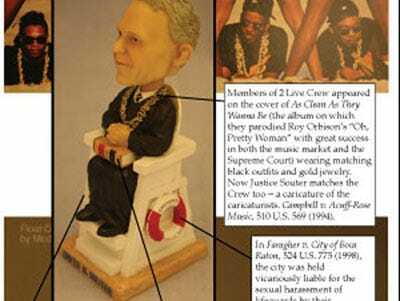 Souter’s sports gold jewelry and sits atop a lifeguard stand — he wrote the opinion in the 2 Live Crew-related copyright case* and one for a sexual harassment case involving a lifeguard. As an added touch, the bobblehead plays part of a Modest Mouse song because he once referred to the band’s “latest release” in an opinion. To be honest, now we really want one. But the Green Bag Web site indicates it’s some sort of lottery system. Too bad. We once had a friend who said, out loud in a law school class, “I’m a sucker for Souter.” We burst out laughing at the time, but this would make the perfect birthday gift! Read Liptak’s full report, including concern over how to properly Dewey-decimal these little devils, here. *If you have never read the 2 Live Crew opinion, it’s a great one. It also served as the basis for the “case memo” on our Texas Bar exam. The memo portion is basically nothing more than an painful extra hour (or so) one has to spend taking the bar, so we appreciated them at least using an interesting fact pattern. We also appreciated Tony Reese for having covered it in Intro to Copyright and thus making the simple essay part even simpler. Thanks Professor Reese!